The idea for an instant coffee that actually tasted good was conceived by our founder Matt Segal while on a climbing expedition to the Bugaboos of British Columbia. On returning to his home of Boulder, Colorado he enlisted natural food rock star, Alex Hanifin to help. Shortly after this dynamic duo of adventure athlete and foodie created our Original Blend of premium instant coffee. 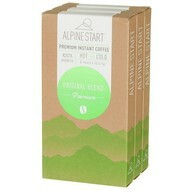 It's Instant Coffee That Actually Tastes Good™ and made from high quality, high altitude arabica beans.